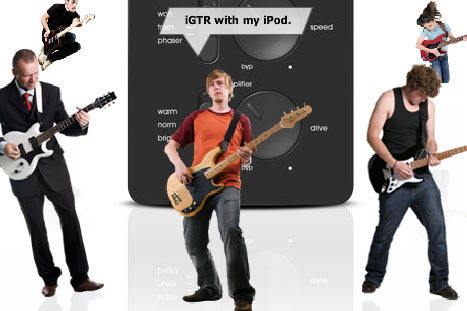 iGTR Lets You Rock Out Anywhere With Your iPod | OhGizmo! By Chris Scott Barr on 02/13/08 • Leave a comment! I’ve recently picked up the guitar (a real one, not plastic) so I’m fascinated by all sorts of different gadgets that might make it more fun to play. The latest device I’ve stumbled upon is the iGTR from Wave. This little guy will let you run both your guitar and your MP3 player through it so you can rock out along with your favorite tunes. You’re going to get a few different tools to tweak your sound such as wah, tremolo and phaser effects, 9 in all. You can listen to the effects here.This would definitely be an awesome way to rock out without bothering everyone in the house. Sure, you could plug some headphones into your regular amp, but you’re not going to be able to hear your tunes. The best part of all is that you can slow down your music when you want to practice those killer solos. The iGTR is easy to carry around, as it will run off of 3 AAA batteries, and comes with a belt clip. It won’t break the bank either, as it will only set you back $100.